Sign up for Broadjam today to follow Melody, and be notified when they upload new stuff or update their news! 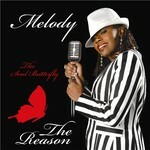 A unique mix of Jazz, R&B, Soul, Funk, & Traditional Gospel sounds... From a refreshing brew of both Contemporary & Classic you get - MELODY'S THE REASON! This song is a song of joy and great gratitude ,,, Jesus is the reason. Inspired by Acts. 17:28 ...In Him we live, move and have our being.